I often get asked where is the best place for expats to retire. When considering moving abroad, a number of considerations need to be made. Are other expats living there? How available is medical care? Are goods and services available? Where is the best place for expats living abroad? Now in our 28th year in the area, we already have built a large community of expats. There are nearly 30 bars and restaurants in the area as well as 11 hotels. 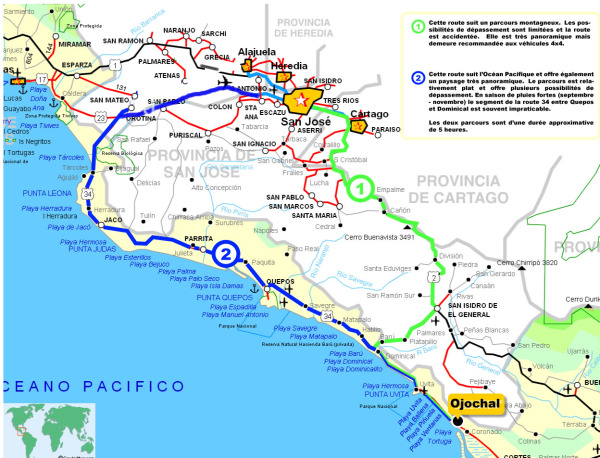 Our developments are located in the coastal towns of Ojochal, Tres Rios, and Chontales in the southern Pacific region of Costa Rica and just above the Osa Peninsula. These three towns touch one another as you drive south on the Pacific Coast. We have done major developments in all three towns and sold many residential lots there, in fact over 1000. This area is located where 6000 foot tall mountains come right down to the sea, providing some very impressive sites for ocean and mountain view residential development. There are also many rivers and waterfalls, so we are fortunate not to have water shortage problems that are common in the northern Pacific region of Costa Rica. This area of the country is also more tightly zoned and construction is limited to three stories. There are no big developments and the area has become a Luxury International Residential Community of single family homes. The part of the coast is also home to some of the most famous beaches in Costa Rica, Playa Ballena, Playa Tortuga, Playa Ventanas and Playa Pinuella. Playa Ballena is a Marine National Park and is located directly in front of our developments. Our community offers a great selection of amenities although we are best known for the wonderful restaurants in our area. Being a coastal community affords us a great variety of fresh seafood. Our town has many great restaurants, some say many of the finest in the whole country. We are also fortunate to have a local Mennonite community that sells fresh breads, cakes, yogurt and home made cheeses as well as two French bakeries right in town. Our topography is some of the most exciting in the country. Our developments are literally located in a hillside "where the mountains meet the sea". This topography allows fantastic ocean view living at a variety of temperate zones. Pacific ocean breezes as well as an abundance of cool mountain air minimizes the need for air conditioning. Behind our main ridge is a 8000 foot ridge, set less than 10 miles back from the front ridge, part of the Talamanca Mountain Range. Nowhere else in Costa Rica do you find topography like this. The southern region is true tropical rain forest with abundant rivers and no water shortages like those commonly experienced in Guanacaste. If you have never been to the southern region, go there before buying any property elsewhere on the coast of Costa Rica, Panama or Mexico. Rapid growth and price appreciation continue but prices are still lower than most other coastal areas of the country and beyond. In addition to our great beaches we also have many waterfalls to swim in, an abundance of nature preserves, hiking trails and parks to visit. The area is home to many tour operators offering sport fishing, horse back riding, snorkeling and scuba diving, birding tours, hang gliding, zip lines, ATV touring, coastal excursions and a host of other activities. Our community is noted for being one of the friendliest among neighbors. Our close proximity to the Terraba River, the longest river in Central America, the marina town of Sierpe and Golfito and the incredibly beautiful Osa Peninsula, continue to attract residents and tourists in ever increasing numbers. Our location is only a short drive from the popular towns of Dominical, Manuel Antonio and Quepos. The southern zone is booming while real estate sales have slowed in the northern and central region. We attribute this to the greater commitment to zoning in the southern region which mandates a three story height restriction as well as a lower density of housing. Safe, clean and lush conditions are what you will find in this area, unlike the high density developments and clear cut land found elsewhere. Baby boomers are increasingly choosing southern Costa Rica as the ideal location for vacation homes, second homes, rental property, retirement homes and real estate investments. Now with opening in April 2008 of the new Hospital De Osa and the paving of the Costanera from Quepos to Dominical, the southern region has become the focus of real estate buyers worldwide. A huge increase in real estate activity has emerged in the southern region as savvy buyers realize this is one of the last places on the Pacific coast where ocean view home sites are still available.. To keep up with demand, Airlines worldwide have continued to add new service to Costa Rica. Direct jet service is now available from many major cities in the US and Europe with travel times as short as 2 1/2 hours. Costa Rica is the place to be and the southern Pacific coast of Costa Rica has some of the best real estate bargains. Don't take our word for it, come see for yourself but don't wait too long or all the great deals will be gone. 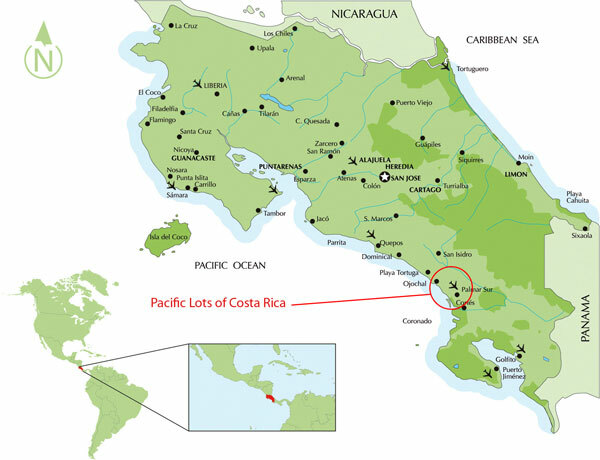 Here is a map showing where we are in Costa Rica. 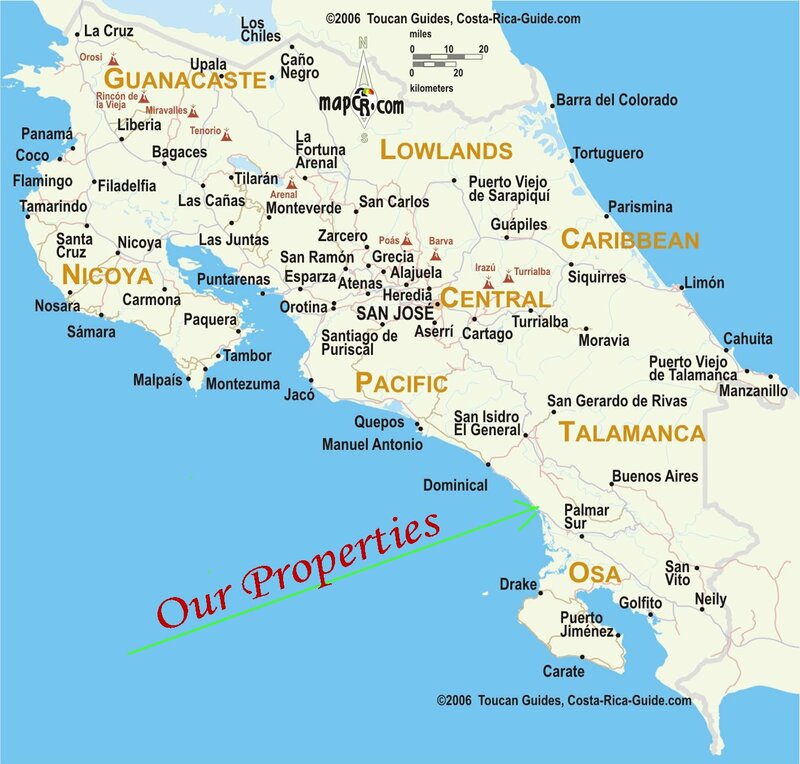 Our properties are located in the Southern Pacific Region of the country just north of th Osa peninsula.